Is Leonardo DiCaprio also aging backwards? 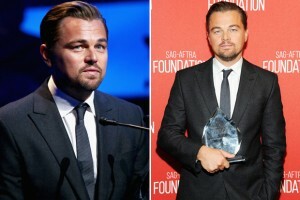 The 40-year-old actor suited up on Thursday night (Nov. 5) for the star-studded SAG Foundation 30th Anniversary Celebration in Beverly Hills, Calif. Leo, who looked slick in a dark grey suit and matching tie, was honored with the Actors Inspiration Award for his work in film and more importantly, his environmental efforts with the Leonardo DiCaprio Foundation. The Wolf of Wall Street star, who accepted his award from friend and fellow actor Mark Ruffalo, told the crowd his “work is just the beginning.” Lee Daniels, Megan Ellison and Rob Marshall were also honored at the gala. Leo’s next film The Revenant opens nationwide Dec. 25. Launch the gallery, above, for more photos of Leo at the SAG Gala.